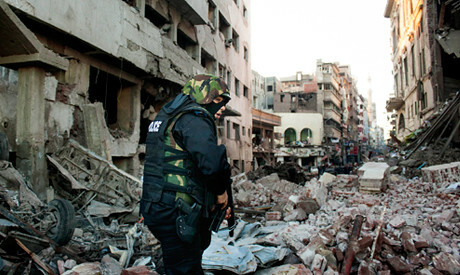 Mansoura blast damage in Egypt's Nile Delta region. A group has claimed responsibility for the attacks that killed over 13 people., a photo by Pan-African News Wire File Photos on Flickr. Ansar Beit Al-Maqdis, an Al-Qaeda-inspired Islamist militant group, claimed responsibility Wednesday for the deadly bombings that rocked the Daqahliya Security Directorate in the Nile Delta city of Mansoura early Tuesday, according to an online statement. "Your brothers in Ansar Beit Al-Maqdis, with the grace of God, were able to target the Daqahliya police headquarters," the group commented on Tuesday's attack in a statement posted on Islamist forums and written in the same format of previous statements released by the militant group to comment on earlier incidents, using a logo featuring a vertical machine gun. The statement added the attack was carried out by a suicide bomber identified as "Abu Maryam." The Mansoura explosion killed 16 and injured 134 in the worst terrorist assault on a government site since the ouster of Islamist president Mohamed Morsi in July. On Monday, Ansar Beit Al-Maqdis warned the country’s military and police, urging troops to desert their ranks or face death at the hands of its fighters. The group said in a statement on militant websites that it deems Egyptian troops infidels because they answer to a "secular government." Ansar Beit Al-Maqdis previously claimed responsibility for several of the terror attacks to hit Egypt since Morsi's ouster in July, including an attempt in September to assassinate the interior minister and several attacks targeting security headquarters and convoys. Since Morsi’s ouster, militants have stepped up their attacks against security forces, especially in the volatile northern Sinai Peninsula where the army says it is waging a war against terror.